This tapestry "Tree of Life Umber" shows a work based on the design of William Morris, the original of which was designed in 1879. The tree of life is a symbol of eternal life, and also the connection between the heavens and the earth. The lush branches of the tree stretch towards the heavens, while the roots reach deep into the earth. As the centerpiece, the tree itself is a rich source of flowers and leaves for the birds that are attracted to it. The forest floor is also filled with flowers, as is the ornate border which accompanies the scene. 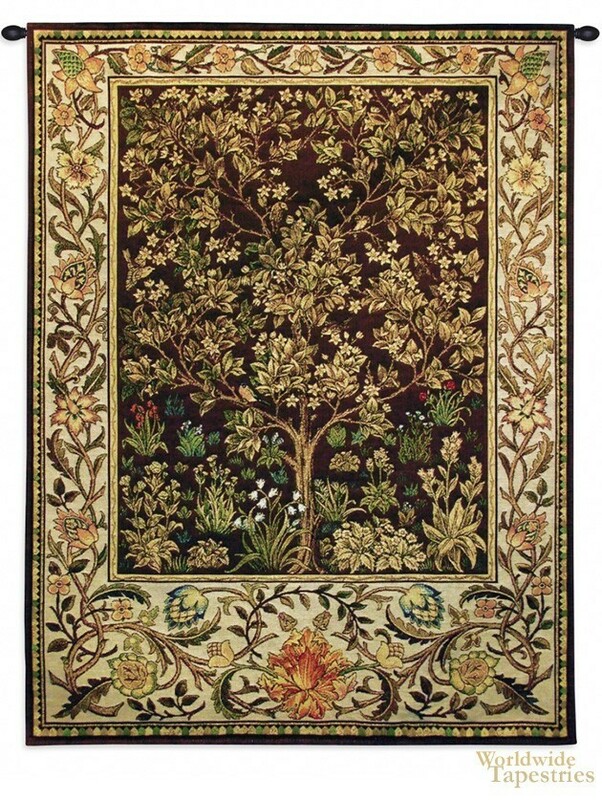 This tapestry "Tree of Life Umber" is backed with lining and a tunnel for ease of hanging. Note: tapestry rods and tassels, where pictured, are not included in the price. Dimensions: W 30" x H 40"
Dimensions: W 53" x H 77"